The Only Common Sense Digital Citizenship Certified School! Common Sense, the national nonprofit organization dedicated to helping kids and families thrive in a world of digital media and technology, has recognized St. Michael’s School as a Common Sense Digital Citizenship Certified School. St. Michael’s is the first and currently the only school in Arizona to receive this recognition. St. Michael’s began using Common Sense Education’s innovative and research-based digital citizenship resources when we implemented our 1:1 iPad program four years ago. The Common Sense curriculum was created in collaboration with Dr. Howard Gardner of the GoodPlay Project at the Harvard Graduate School of Education. The resources teach students, educators, and parents tangible skills related to Internet safety, protecting online reputations and personal privacy, managing online relationships, and respecting creative copyright. The free resources are currently used in more than 90,000 classrooms nationwide. To learn more about the criteria St. Michael’s met to become certified as a Common Sense Certified School, visit http://www.commonsensemedia.org/educators/certification. During the first trimester, members of our faculty have been busy attending conferences. Mrs. Divijak attended the Emerging Leaders Workshop put on by CalWest Educators in Los Angeles October 17 & 18. This workshop serves to develop and cultivate future leaders in our independent schools. Arizona Health and Physical Education State Convention sponsored the “Let’s Move Arizona” convention in Phoenix on October 17-18. Both Coach Beckelman and Coach Santucci attended. The Southwest Association of Episcopal Schools conference is this week in San Antonio on November 14-16. Mrs. Moore, Ms. Garcia, Mrs. Schultz, and Mrs. Stout will be attending. Mrs. Stout will be presenting her “Digital Citizenship” materials. 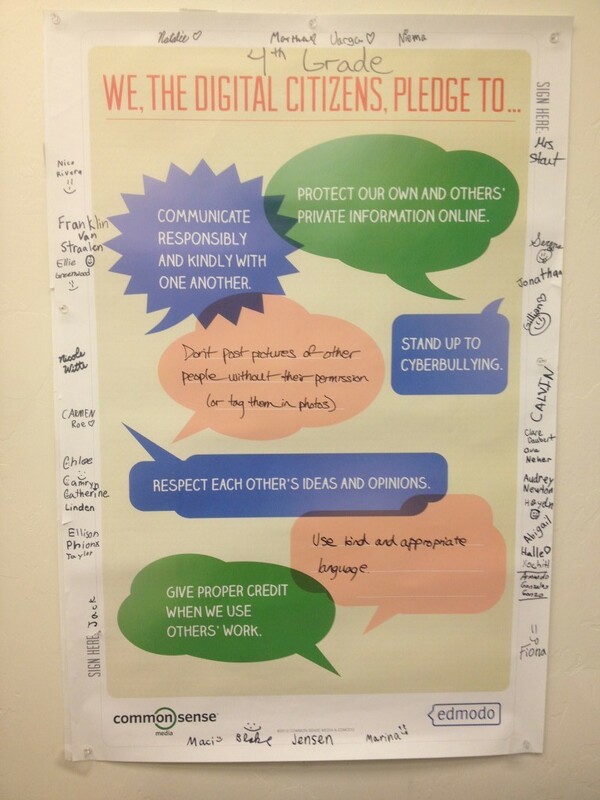 During the month of September, students in grades K-5 learned about the following digital citizenship topics. Please see the attached document for families in order to continue the conversation at home. This is our second year teaching a digital citizenship curriculum to all grade levels. In lessons that happen about once per month, we cover topics related to Internet safety, privacy and security, relationships and communication, cyberbullying, digital footprint and reputation, self-image and identity, information literacy, and creative credit and copyright. You can see the scope and sequence here: Common Sense Media’s K-12 Digital Citizenship Curriculum. If you have any further questions or comments, please don’t hesitate to contact me!